The husband has been wanting to paint his garage floor for a long time. 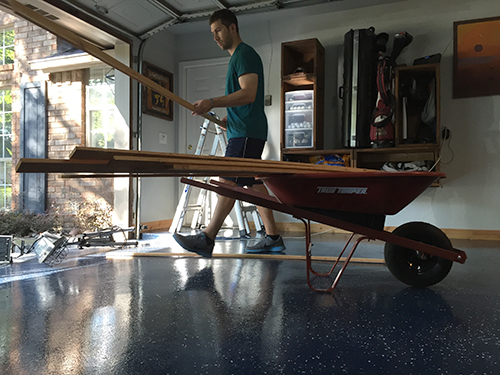 I've always resisted this idea because, really, who cares about the garage floor? Whenever I said that my husband would reply, "Who cares about curtains? Who cares about throw pillows? Who cares about coffee table books?" 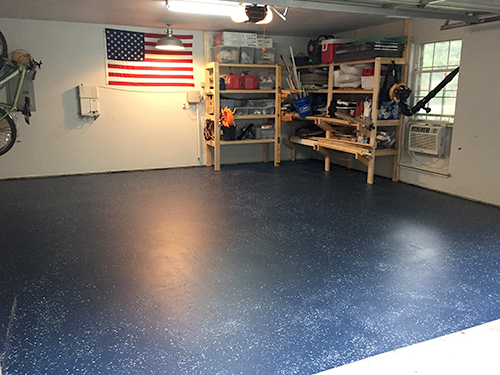 Anyway, he finally got around to painting the garage floor a couple weeks ago and I must say, it looks fantastic. It really sets off the freshly painted walls and makes the space look very custom, which is what he wanted. The garage is his happy place and he takes such good care of it, so he really deserves this fancy floor. I'm glad he finally talked me into it! I originally questioned whether we would get the return on our investment for this project, but I definitely think the money was well-spent. I know my husband was swayed by garages when we were house hunting, and I have no doubt that others value that space as well when they are making buying decisions. You never know, our garage might be the cherry on top for someone when we decide to sell this place! In case you're wondering what's happening in that photo above, my husband thought, "Why stop at painting the floor? Why not add cedar baseboards and crown moulding, too?" Sometimes it blows my mind how much he loves working on his garage. Man cave, indeed. Also, how cool is that orange hose thingamabob in the photo above? It connects his nail gun to the air compressor so he can work all over the garage without dragging the compressor around. It's a pretty handy little tool. 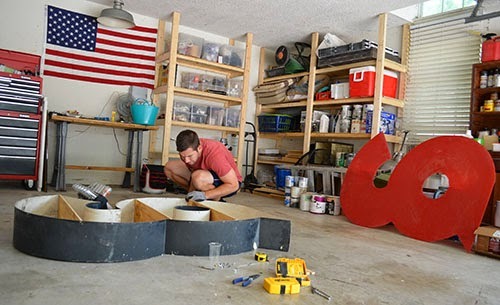 It's a pretty simple process, but unfortunately I don't have photos because he did this project while I was at work. Let's start with the supplies. 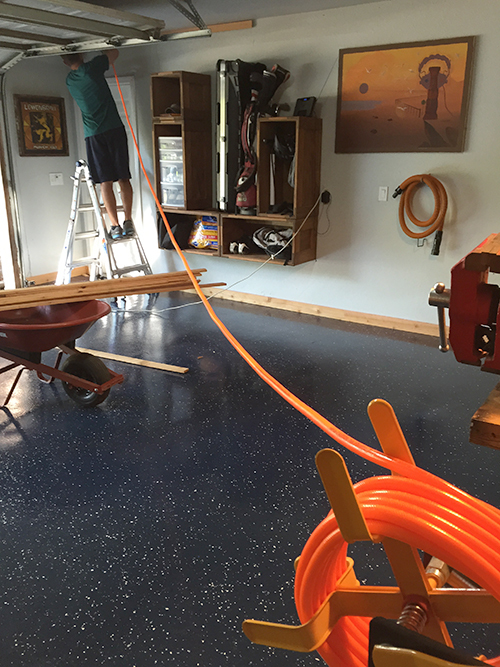 We used the most affordable floor paint we could find, Seal Krete Epoxy Seal Concrete Garage and Floor Paint. 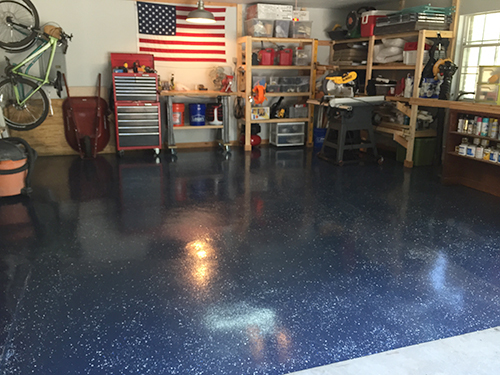 It didn't have the best reviews, but we knew we were going to go over it with a high-quality protective clear coat (Rustoleum Epoxy Shield Premium Clear Coating Floor Coating Kit, which has great reviews) at the end, so we were OK with using lower-quality paint underneath. Our paint vendor had a limited selection of colors, so we chose the darkest blue they offered. 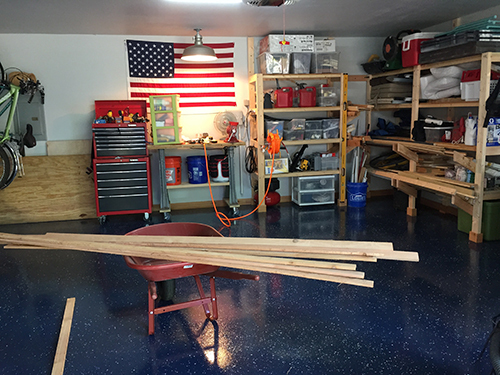 We bought two gallons of floor paint and one floor coating kit, which was enough for one coat of the blue color and one protective clear coat. 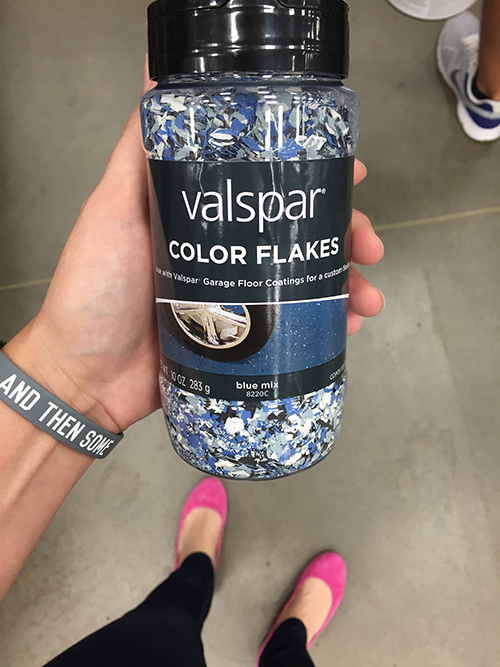 When painting the floor, you have to do small sections at a time, and then stop to sprinkle the wet floor with the Valspar Color Flakes. It takes a little bit more time than just painting, but I think it's well worth the extra effort. We only needed one bottle for our entire garage floor. The paint has to be left alone for 24 hours to make sure it sets before the clear coat, and then the clear coat needs 72 hours to seal. You can see the sandy texture in the photo above, which prevents slipping when the floor is wet from the rain. That's the anti-skid additive that comes with the Rustoleum premium floor coating kit. Our total cost for materials was about $200 for this project, which isn't too bad. I'll be sure to follow up every so often to let you know how the paint is holding up, since right now I can't really comment on the durability. So what do you think, is it money well spent? 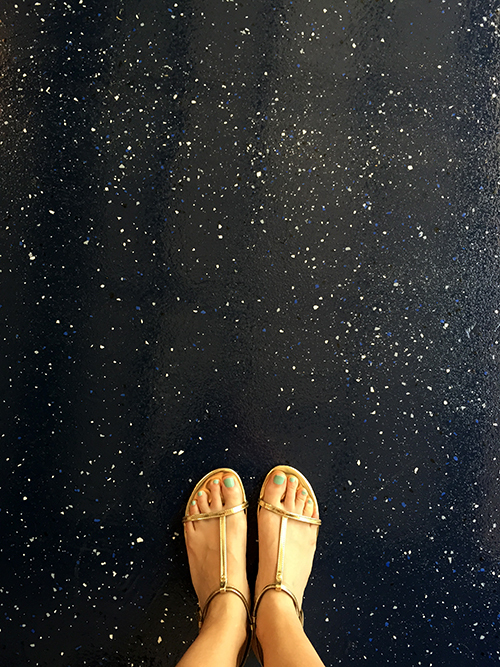 Would you paint your garage floor?